This condo features two bedrooms, two bathrooms, living room, and dining room. The kitchen includes a breakfast area and pantry. The master bedroom has a large walk-in closet and a private bathroom with a shower and single sink vanity. 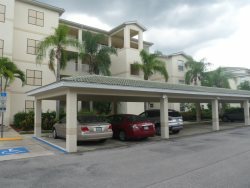 The condo has a screened lanai where you can enjoy the stunning lake views and warm Florida breezes. Whether you enjoy unwinding outdoors at the resort-style pool or working out in the indoor exercise and lap pool, swimmers have an array of options to choose from at Pelican Preserve. For the nature lover, Pelican Preserve offers a 38 acre nature preserve with a boardwalk where you can catch a glimpse of herons, hawks, rabbits, squirrels and other wildlife as you play golf, stroll through the community or simply relax on your lanai.